Schneider-Kreuznach is a well respected lens maker, who primarily has specialized in ultra-high end cinema lenses and large format photographic lenses for their subsidiary company B+W, which is probably the most well respected photographic filter maker in the business. They also make many of the lenses for the Samsung NX series mirrorless cameras, though the construction isn’t quite reminiscent of their other top grade lenses. There are a few things that are a little disappointing about this lens, at least how it fits into the existing Micro 4/3 range of lenses. At 14mm, it covers a range that is already massively represented by existing Micro 4/3 lenses. Already covering this range are all versions of the Olympus 14-42mm kit lens, All versions of the Panasonic 14-45mm and 14-42mm kit lenses, the Olympus 12-50mm zoom, both the Panasonic and Olympus 14-150ish super zooms and the Panasonic 14mm f/2.5 pancake lens. Needless to say, it’s not a focal length that is missing from the lens lineup. At f/2.0, it offers only a slightly brighter view than the much smaller Panasonic 14mm f/2.5 pancake. While not unexpected, this lens will be quite expensive. No official price has been released, but they have said the target is ‘under €1500’. That’s not cheap. For this reason, it’s not going to be a lens that I think will sell in large volume. There’s nothing wrong with that, but it’s a lens that isn’t going to stir a ton of excitement on specs alone. However, I think there IS reason to be excited for this lens for high end users. While some of the more ‘exotic’ lens makers like Zeiss and Cosina Voigtlander have made lenses for many different formats, including Micro 4/3, when these lenses have come to formats other than their native mount (or any mount in the case of Voigtlander), they have been strictly manual focus lenses. While Zeiss has at least made for autoaperture control with their ZE and ZF line for Canon and Nikon, they still are left without AF. Schneider-Kreuznach, however, has made this first entry a true, completely native Micro 4/3 lens. It has full electronic aperture and autofocus, plus a focus ring that works like the rest of the native lenses. It’s wonderful to see a high end lens maker embrace a third party mount with such completeness. It bodes very well for the future. 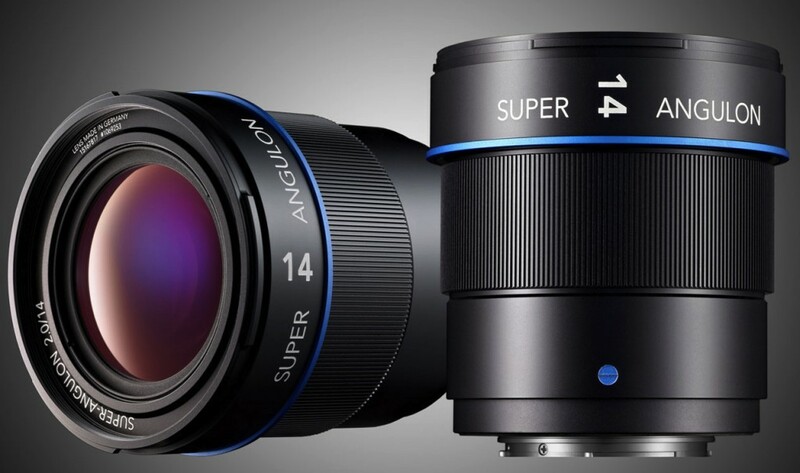 The Super-Angulon lenses have historically been absolutely stellar optics. There is every reason to believe, especially given the premium pricing, that this will be the highest performing Micro 4/3 wide-angle, and probably by a good margin. There’s a little pressure here as well if it doesn’t live up to expectations, but I’d expect this lens to be essentially razor sharp corner to corner with extremely minimal CA and distortion. Should be a truly pro-grade optic. Schneider-Kreuznach has said two additional lenses are slated to be released later already. We can only hope that they build out a rather exciting lineup of really high grade stuff. Again, ultra-high grade native lenses are a really welcome addition to the system. So there you have it. While this lens will likely be well out of my budget for a 14mm lens, I am really excited to see that they’ve committed to the m4/3 mount in full force with a truly native lens. The company’s reputation for creating outstanding lenses gives me hope that this lens will be a truly world-class optic. I hope for more great things to come from this new entry to the format. I’m looking forward to reading the reviews (and hearing the final price)…even if the focal length doesn’t interest me much. At some point I’ll need something in this range, and it will be nice to have options. I have to wonder how it will compared to the wide end of Olympus ZD 14-35mm f/2.0, which is rather amazing on its own. Get the Olympus m.Zuiko 12mm f/2.0 instead. Cheaper, wider, and optically excellent. I am now waiting for the new SK lenses (MFT and HDSLR) for quite a while (actually for more than 3 years). Maybe it is time that somebody informs the company that MFT does not mean “(M)aybe in (F)our years (T)hinkable” and HDSLR does not mean “(H)ow (D)oes (S)chneider (L)enses (R)einvent” (because I think this is not necessary). Time from announcement to availability: not adequate for a company which claims to be a world market leader in photography !!! I do believe this lens will fill a gap in the MFT range, namely a wide angle lens that is as sharp and renders color as well as the 75mm Olympus. Owning the 12mm f2, I can say it is not in the same league as the 75. The extra glass in the Super Angulon, should add sharpness and reduce distortion. The 12 and Oly 17mm both have massive distortion, corrected in camera at the expense of resolution. I bet Schneider’s research indicated they could squeeze more IQ out of a 14mm than they could out of a 12. I will definitely pick one up for critical studio work, perhaps replacing my Nikon D3x and 24-70mm. It has been 3 years since Schneider announced its PRO grade lens…….